Estes belongs to a rich history of artists who have depicted New York City. He is known for his street scenes of Downtown Manhattan and of Manhattan's Upper West Side and has revealed a detailed knowledge of the city's diverse architecture, infrastructure and habitants. Although not a native New Yorker, New York has been his home for over thirty years, and he continues to explore what have become familiar locations in his work. The Ansonia, an old Beaux-Arts building, and its surrounding streets on the Upper West Side, for example, became a favoured motif in the 1970s and recurs in paintings from the 1980s and 1990s. These latter-day versions may well record the site's changes, but this is a by-product. More significantly they show Estes' maturation and his ability to reinvent continually. Estes' principal concern is not with recording the city, but manipulating its various structures and surfaces to explore specific pictorial changes. The composition of his earlier street scenes is characterised by a slant reflection, in which the street on one side of the painting is reflected in a window on the other. More recently he has widened these street scenes to include several streets moving away at different angles. In both cases he is inventing methods to organise space and move the viewer into and across the painting's complexity. Such works have an organisational geometry which, although suggested by the site, is the outcome of considerable spatial and compositional changes. For Estes does not imitate reality but, through a painting process which is fluid and open-ended, he constructs a world of bracing clarity and exacting order. Estes' paintings often deal with the juxtaposition of interior and exterior spaces, which is evident in Nedick's, 1970, the first painting wherein the artist began to expand his view and imagery to go beyond the close-up, straightforward inspection of storefronts, windows and reflections. 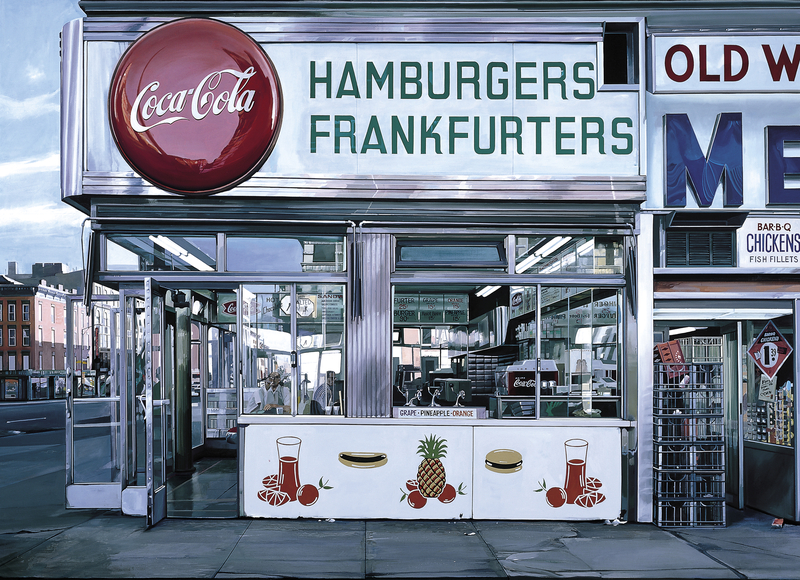 Estes began moving toward his mature Photorealist works with his depictions of reflections in automobile windows and shiny metal. He then raised his camera and focused on close-up renditions of store front windows, with attention to what was in the windows as well as what was reflected in the windows. Nedick's, 1970, for the first time shows a distant cityscape off to the left side of the painting. This is a pivotal work in other ways as well. The artist chose a subject which allowed him to find and paint reflections not only on the window surface, but on the mirrors twenty feet back into the store. The painting also includes areas where the viewer looks through windows and doors back to the outside and off into the distance. This contributed to the complexity and awakened the artist to the artistic challenges he could and would undertake in the new decade. The short depth of the interior and the distant view of the city street are also precursors and predictions of work Estes would do in the 1980s and 1990s as he split his images between short interiors of buses, trains and boats and the long views of bridges, water and city landscapes. As the 1970s progressed he became firmly accepted as the leading and most important artist in the movement called Photorealism.